Alpha Wave Movement (aka Greg Kyryluk) has been a consistent yet consistently quiet name in the ambient/spacemusic scene since the mid-90s. I feel like AWM slips under most listeners’ radar, and this is a shame because he’s an artist who should not be missed–and that is firmly proven on his new release, Architexture of Silence. Doled out in five mid-length movements, this release serves up classic spacemusic with Berlin School undertones to take the listener on a quite comfortable, very laid-back voyage. Kyryluk’s sound is warm and soft throughout. His graceful pads and silky arpeggios trace glowing lines across your mind’s eye, laying out arcs which he then anchors with solid bass sequences. Tempo shifts are handled with the utmost skill as Kyryluk gently guides the throttle without a hint of hurry or turbulence, and the balance is superb. There are long, hushed and thoughtful passages where we drift through space; there are brightly twinkling, wonderfully analog-feeling spaces, exemplified Movements II and IV; and there are hefty, sequencer loaded runs such as Movement V, which rises out of calm pads to pick up a dose of pure energy and ends up playing out like a perfect homage to the EM pioneers of yore who first charted these spaceways and described their vistas. Architexture of Silence is one of those releases that reminds me why I fell in love with this music in the first place. I like its subtlety; Kyryluk keeps things on the quiet side, letting the simplest rhythmic elements nudge the intensity of a piece to take it from ambient drift to light, spacey groove. The flow is impeccable, and turns the disc into a seamless voyage that you just don’t want to end. When he does opt to actually ramp it up in the middle of Movement V and heads into solid Berlin territory, it’s loaded with a great nostalgic resonance, every metallic, twanging sequencer angle and low-end bass thrum firing like memory. He builds to this point throughout the disc, and when it arrives as the payoff, it’s excellent. I’ve had this release looping for hours during my review listens, and it’s a pure pleasure to hear again and again. 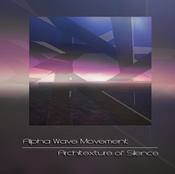 It’s full of dimension, it’s technically gorgeous, and it showcases the absolute talent that is Alpha Wave Movement. Go get this.